Delivered Tulsa 1/2/44; Grenier 27/2/44; Assigned 401BS/91BG Bassingbourn 7/4/44 ANNE, then THE BLOODY BUCKET; 322BS [LG-Y/X]; 324BS [DF-Y]; battle damaged Dresden 14/2/45 with Joe Bilotta, Bob Fuller Wounded in Action, rest ? 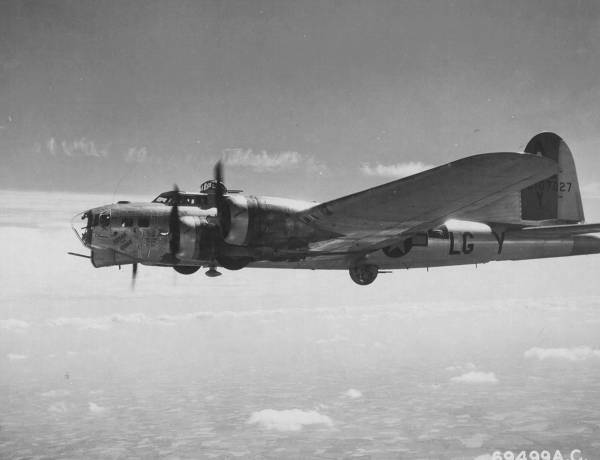 ; force landed Denain, Fr, an RCAF airfield 20/2/45; (first B-17 repaired on continent & ret to group); After VE-Day transferred Istres, S. France with 384BG and carried POWs and displaced persons from North Africa, adorned with airline type strips on fuselage; 125+m Salvaged 9AF 31/12/45. HIKIN‘ FOR HOME.